We Brazilians have been massacred by high taxes indeed. By God’s standard, government should punish criminals and praise good people (Romans 13). But the Brazilian government wants to occupy the role of good people. So it takes from Brazilians much of their hard-earned money through high and corrupt tax laws. Its excuse is to grant Brazilians education, health, housing, etc. I doubt that these massive protests will change the corrupt Brazilian government and its actions to massacre its people through its high taxes. Only God can help the Brazilian people! Please, pray for Brazil, so that its Christian leaders may understand the right place for government and taxes and be tools for a revival. 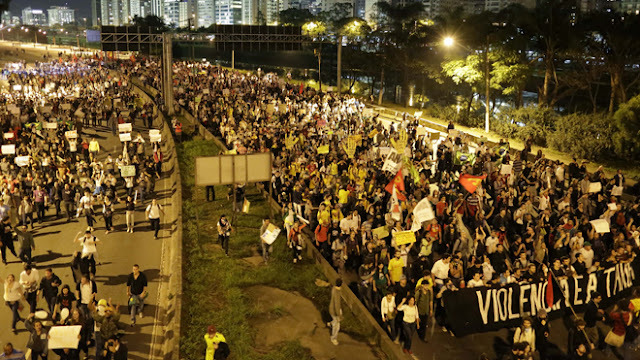 June 17, 2013: Protestors march in Sao Paulo, Brazil. SAO PAULO – Some of the biggest demonstrations since the end of Brazil's 1964-85 dictatorship have broken out across this continent-sized country, uniting tens of thousands frustrated by poor transportation, health services, education and security despite a heavy tax burden. More than 100,000 people were in the streets Monday for largely peaceful protests in at least eight big cities. However, demonstrations in Rio de Janeiro and Belo Horizonte were marred by vandalism and violent clashes with police. About two dozen people were reported injured. The wave of protests, which began over a hike in bus prices, was also in large part motivated by widespread images of Sao Paulo police last week beating demonstrators and firing rubber bullets during a march that drew 5,000. In Rio, the violent police crackdown on a small and peaceful crowd Sunday near the Maracana stadium incited many to come out for what local news media described as the city's largest protest in a generation. Tuesday's newspapers and morning news shows were filled with images of clashes between demonstrators and police in Rio, Porto Alegre, Belo Horizonte. The vast majority of Rio's protesters were peaceful, but a small group of demonstrators attacked the state legislature building, setting a nearby car and other objects ablaze. The newspaper O Globo cited Rio state security officials as saying at least 20 officers and 10 protesters were injured there. A cyber-attack knocked the government's official World Cup site offline, and the Twitter feed for Brazil's Anonymous group posted links to a host of other government websites whose content had been replaced by a screen calling on citizens to come out to the streets. In a brief statement late Monday, President Dilma Rousseff acknowledged the demonstrations, saying: "Peaceful demonstrations are legitimate and part of democracy. It is natural for young people to demonstrate." Rousseff recently saw her popularity rating recently dip for the first time in her presidency, largely over sluggish growth, increasing inflation and security worries. Rousseff faces re-election next year. Brazilians have long tolerated pervasive corruption, but in about 40 million Brazilians have moved out of poverty and into the middle class over the past decade and they have begun to demand more from government. Many are angry that billions of dollars in public funds are being spent to host the World Cup and Olympics while few improvements are made elsewhere. In Rio, the confrontation between police and a small group of protesters dragged on late into the night despite sporadic rain. As the group moved on the state legislature building, footage broadcast by the Globo television network showed police firing into the air. At least one demonstrator in Rio was injured after being hit in the leg with a live round allegedly fired by a law enforcement official. Local news media reported that a high school student in Maceio was shot in the face after a motorist forced his way through the demonstrators' barricade. Protesters were raining fists down on the car when a shot was fired. The extent of the 16-year-old's injuries were not immediately known. In Sao Paulo, Brazil's economic hub, at least 65,000 protesters gathered Monday at a small, treeless plaza then broke into three directions in a Carnival atmosphere, with drummers beating out samba rhythms as people chanted anti-corruption jingles. They also railed against the action that sparked the first protests last week: a 10-cent hike in bus and subway fares. Thousands of protesters in the capital, Brasilia, peacefully marched on Congress. Dozens scrambled up a ramp to a low-lying roof, clasping hands and raising their arms, the light from below sending their elongated shadows onto the structure. Some congressional windows were broken, but police did not use force. "This is a communal cry saying: `We're not satisfied,"' Maria Claudia Cardoso said on a Sao Paulo avenue, taking turns waving a sign reading "(hash)revolution" with her 16-year-old son, Fernando, as protesters streamed by. Protest leaders repeatedly warned marchers that damaging public or private property would only hurt their cause. Many Brazilians were angry over Sao Paulo's first protests last week after windows were broken and buildings spray-painted. Police, too, changed tactics. In Sao Paulo, commanders said publicly before the protest they would try to avoid violence, but could resort to force if protesters destroyed property. There was barely any perceptible police presence at the start of Monday's demonstration.